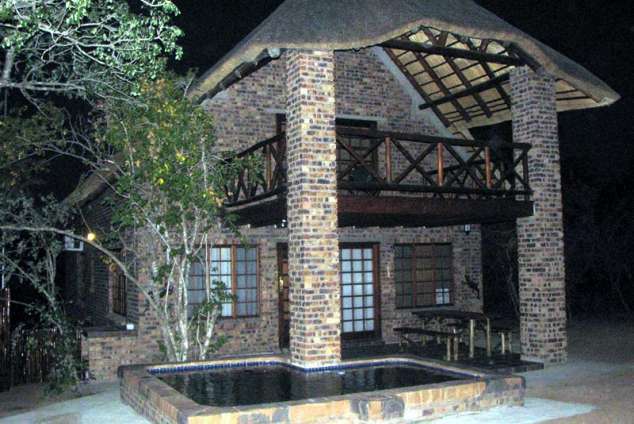 Pemba Lodge - Marloth Park Accommodation. Pemba Lodge is situated on the southern border of the world famous Kruger National Park in Marloth Park. Marloth Park which is a private residential Nature Reserve where the Kudu, Zebra, Warthog, Impala, Giraffe and Wildebeest walk freely around the residence. It is a new double storey thatched roof establishment with magnificent views from all the rooms and deck. The splash pool overlooks two waterholes not far from it. There is a television with a DSTV decoder - just bring your own SMARTCARD. The lodge has four bedrooms, four single beds, two double beds, and three bathrooms. Fully equipped kitchen with microwave. There is a boma with and a braai. Lockup Garage and a washing machine are available. One of the activities from the deck is bird watching, there are over 300 different bird species in the area. You are a fifteen minute drive from Crocodile Bridge entrance to the Kruger National Park. You can travel to Mozambique, Swaziland or to the rest of the Lowveld. Trips to Mozambique and Kruger National Park can be arranged. Marlothpark has it own game reserve namely Lionspruit where Lions and rhino also can be seen together with the other wild animals. No pets allowed. Remember, this is a Malaria area - please take precautions. When entering Marloth Park you will be on Olifants Road. Continue with Olifants Road for approximately 6 kilometers until you find the Bush Center on your right hand side. The center is clearly market, within the center you will find the security company ''Fields Security'' Tel 013-7924207. They have a map of Marloth and will be able to direct you to the unit; however it is advisable to purchase a map at the shop in the Bush center for R3.25 to help you find your way around Marloth. Ask for the keys for 169 KUDU booked under your name. E.g. When exiting the Bush Centre turn left onto Olifants Road. Turn left onto Kudu Road; continue until number 168 and 170 turn right go past the first house on the right and turn right to Pemba Lodge. 29878 page views since 11 Apr, 2007.